I love trees. Not surprisingly, many of my favourites are in my own garden, Glen Villa, and I wrote about some of them here. 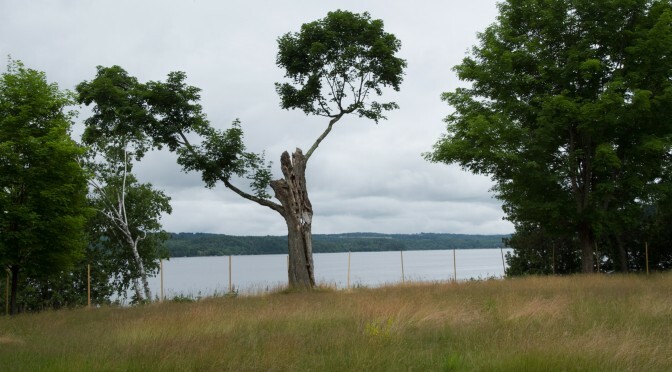 But in my travels, I’ve come across many other special trees, and they stand out in my memory for different reasons. One I remember because of its size. The Angel Oak, still growing on John’s Island, South Carolina after some 400 years or more, is so large that I couldn’t capture it in a single photo. I simply couldn’t stand far enough away — the longest branch stretches 187 feet from the trunk. The shade beneath this southern live oak (Quercus virginiana) is dense and provided welcome relief on a hot day. 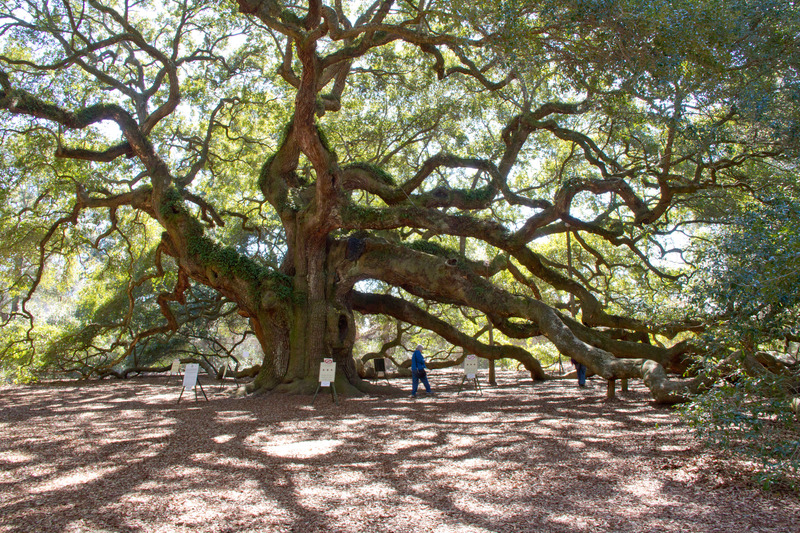 A visitor walking in the shade gives you an idea of the size of the oak — gigantic. Another tree is memorable because of its roots. 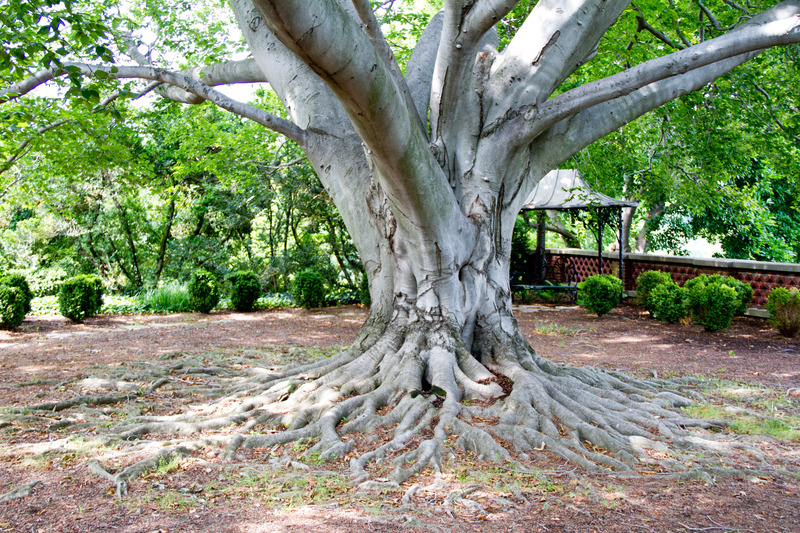 The beech tree (Fagus grandifolia) standing on the aptly named Beech Terrace at Dumbarton Oaks in the Georgetown district of Washington, D.C. offers a fine introduction to this garden, designed by Beatrix Ferrand in the 1920s for Robert and Mildred Bliss. I’d love to see the tree in springtime, when the Crocus tomasinianus, Scilla siberica and Chionodoxa luciliae bloom among its roots, lighting up the ground in shades of blue, and calling even more attention to the beauty of the blue-grey trunk. Roots writhe across the ground like the snakes in Medusa’s fright wig. 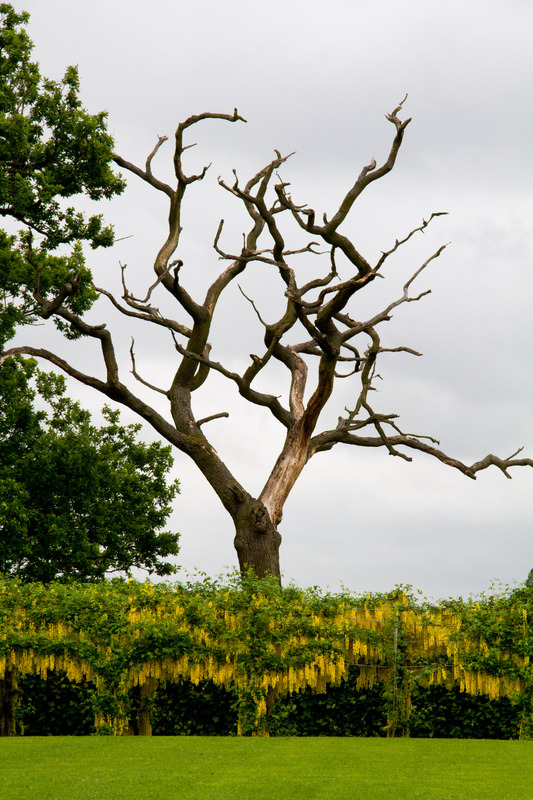 Writhing branches characterize a tree at Broughton Grange in England. I can’t identify the tree (can you?) but standing tall behind a laburnum allée it has become a smashing piece of sculpture. It’s tall — the laburnum tunnel must reach at least ten feet and the tree towers above it. Alongside this section of Broughton Grange’s extensive grounds is a walled garden designed by Tom Stuart-Smith. If he was the one who advised against removing the tree, I say bravo! Not every garden designer or owner would want to have a dead tree in the garden. But why not, if it is as gorgeous as this one? 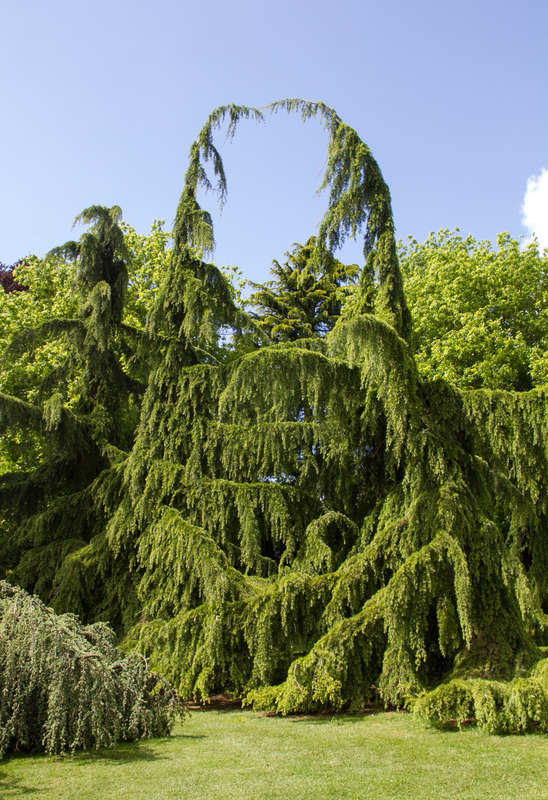 “Age cannot wither her, nor custom stale her infinite variety.” Shakespeare penned these words to describe Cleopatra but they seem to suit as well the ancient Cedar of Lebanon (Cedrus libani) at Painshill Park near London. 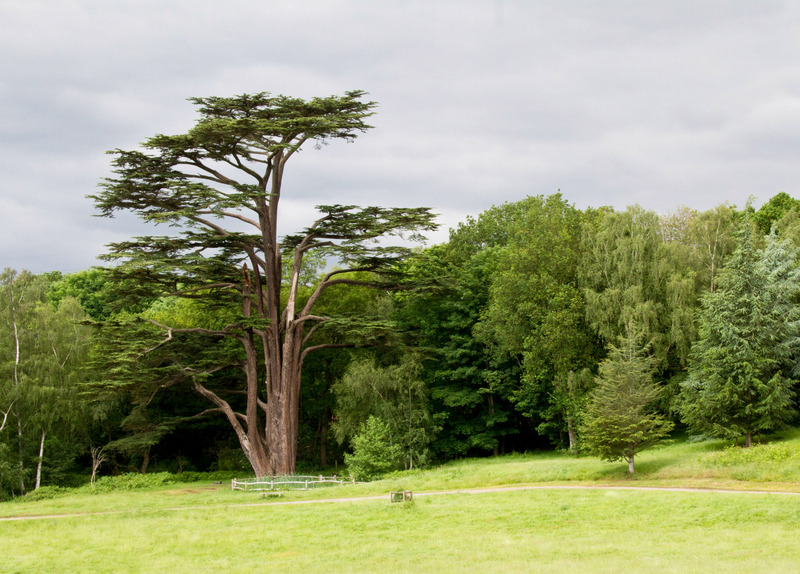 Looking at the tree, said to be the oldest of its kind in England — and possibly the largest in Europe — I am struck by the grace of its form, not symmetrically balanced but with a satisfying asymmetry which complements the Romantic ideas that inspired this 18th century landscape garden. Charles Hamilton designed and constructed Painshill between 1738 and 1773. He went bankrupt as a result. Age hasn’t withered an ancient olive tree at Villa Adriana, or Hadrian’s Villa, in Tivoli, near Rome — it’s producing olives even at a ripe old age. The Villa is now a UNESCO World Heritage Site, and the gnarled and twisted trees form a romantically evocative grove in the surrounding grounds. According to on-line information, it is hard to date the trees because the inner part of an olive tree rots while the tree keeps growing laterally. 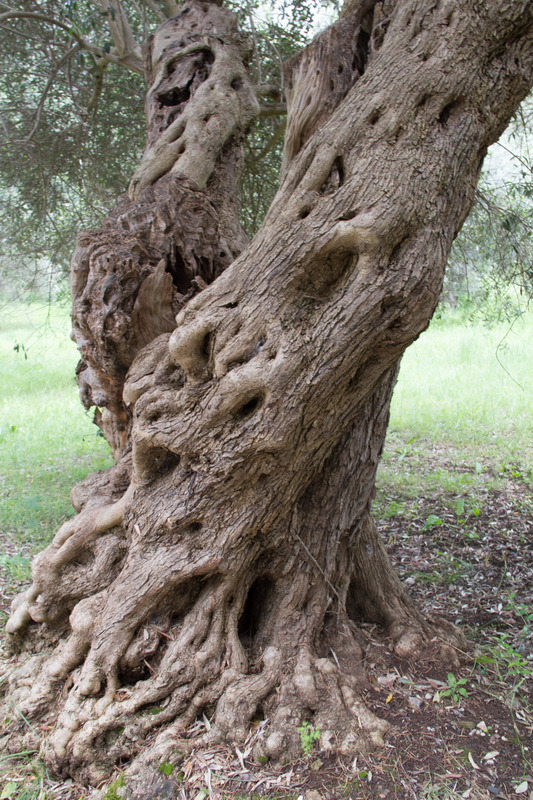 Many of the ancient olive trees are hollow, showing how they rot from the inside yet remain alive and productive. Some trees stick in my mind because of the extraordinary way they’ve been distorted. 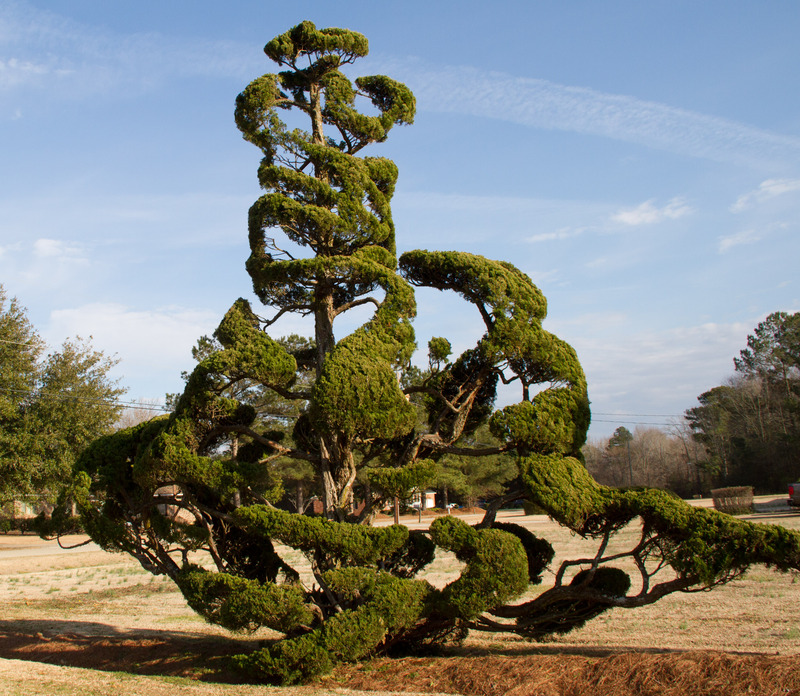 The tree below is in the Bishopville, South Carolina garden of Pearl Fryar, a self-trained topiary artist. About 30 years ago, he began trimming the evergreens around his yard into unusual shapes, creating living sculptures that are as memorable as the man himself. Pearl Fryar’s masterpiece, a tree in full sail on a suburban lawn. Pearl Fryar’s trees made me smile. So did these two giant trees at Ascott, in Buckinghamshire, England. To my eyes they seem to be growing together, trying to form a single heart silhouetted against the sky. This vision may be fantasy on my part, but perhaps not: as I wrote in a review of the gardens a few years ago, Leopold de Rothschild had the gardens designed and gave them to his wife as a wedding present. Suitably, a sundial spells out his attachment in tightly clipped yew: “Light and shade by turn, but love always”. So why shouldn’t the trees continue to reflect his commitment? Do you see a heart-shaped tree or am I imagining it? Different trees arouse different emotions. This knobby old specimen at Stourhead, a National Trust property in Wiltshire, made me do a double-take. 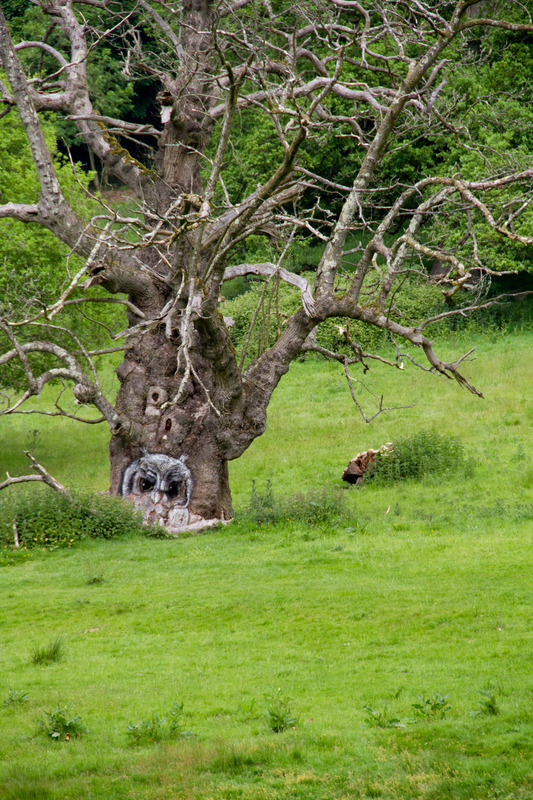 Was I really seeing an enormous owl at the base of the tree? Who had the brilliant idea to transform the dark pock marks on the tree trunk into the eyes of an owl? Other trees have made me sad. 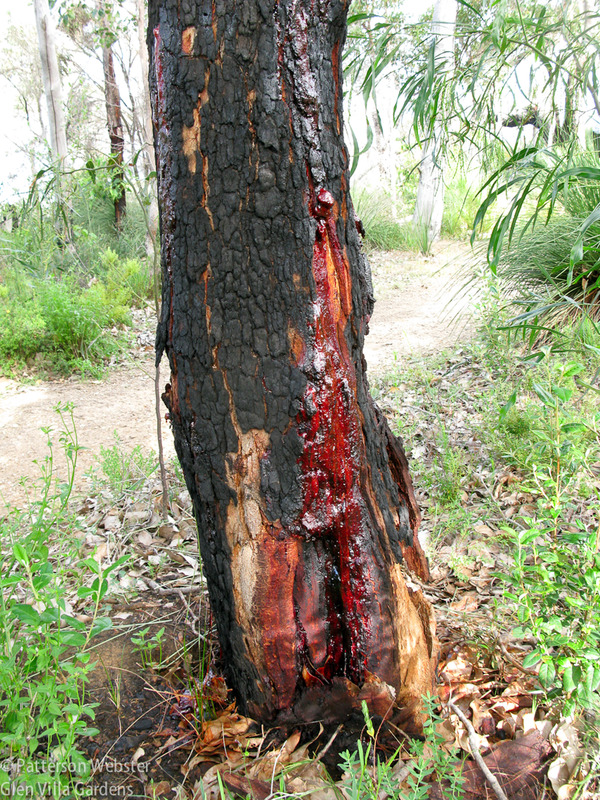 How could I fail to feel otherwise when I saw an Australian tree that seemed to be bleeding to death? 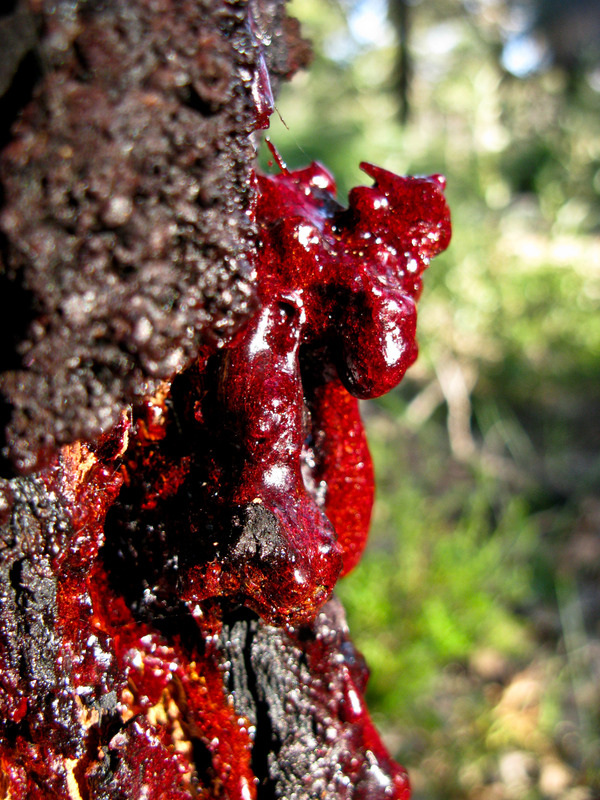 Its name fits the picture — it’s called bloodwood. I felt better when I learned that Australian Aboriginals collect the sap, either when it is liquid or after it has crystallized, and apply it to sores or cuts as an antiseptic. If I’m correct, this is a Bloodwood tree, or Corymbia opaca. It begins to bleed when bark falls off or when the tree is damaged. The sap closes the wound. Sometimes the red gum hardens into funny shapes, like the mini-devil clinging to the side of the tree below. Proving, I suppose, that even sad things can bring a smile when the shape is right. A funny red gum man clings to the side of the bloodwood tree.